The Cove is home to many great little critters. This unique hub of the high desert attracts some super cool insects, reptiles, rodents, and other creatures and if you enjoy the view close to the ground, or low in the grass or sage, you are bound to see ‘em! Just the other day on a walk near the Crooked River Day Use, I was walking in between some big boulders and I noticed a little flash of rainbow out of the corner of my eye. 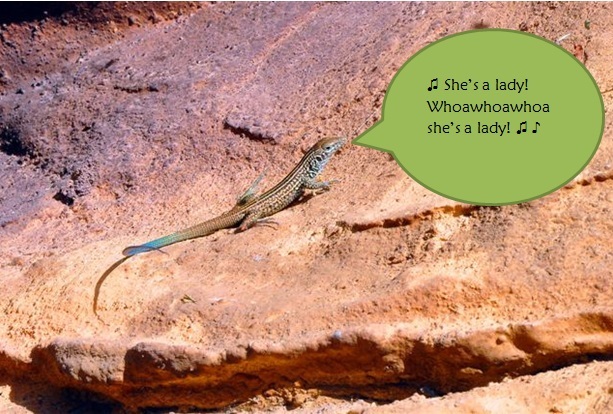 I looked over and there was an awesome little Plateau Striped-Whiptail Lizard, enjoying the sunshine with me. That flash of rainbow I saw was it’s crazy coloration that blends into a bright, lightening-blue tail. As I’ve mentioned in earlier posts, the Plateau Striped-Whiptail is a pretty unique species to our park. The lizard is only found in Oregon at the Cove Palisades, and then some random places in Arizona. How cool is that? It is my favorite animal in this park, and I’m so excited because in June, these little whiptails like to hang out on the front porch of my office early in the morning. Like I spilled a hundred crazy marbles, they will zip off my porch in all directions, over my boots and into the sagebrush. They are probably the quickest lizard I have ever met, and it’s a fun wake-up to start my day. 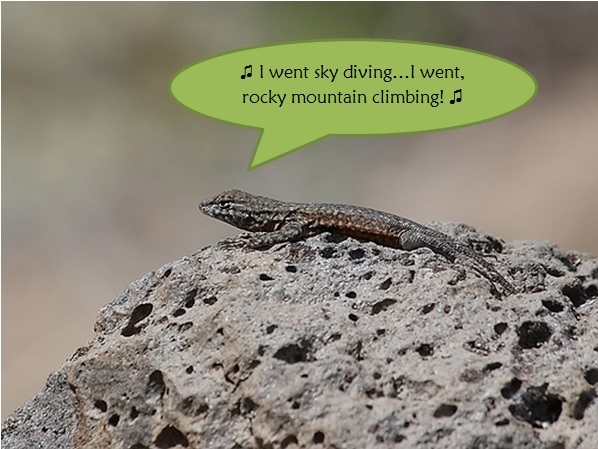 I was inspired after seeing this little lizard yesterday to write a post about the lizards in our park, and some interesting tidbits about them. I have chosen our 4 most popular lizards for you to read about, and maybe when you come to the park you can take a lizard trek to try and identify them. They are hilarious to watch and very curious, they might try to identify you first before you even notice them! This lizard has a very unusual mating strategy, known as the “Rock-Paper-Scissor” strategy! There are 3 different types of “colorful” males (Orange, Blue and Yellow Throated) and each have their own unique mating patterns! The 0range-throated males are the strongest, and do not form bonds. Instead, they just steal partners from the blue-throated males. So, to put it in perspective, they are like that cowboy that doesn’t ask your lady to dance at the bar, he just kinda well, grabs her and dances with her and makes you hold his beer. 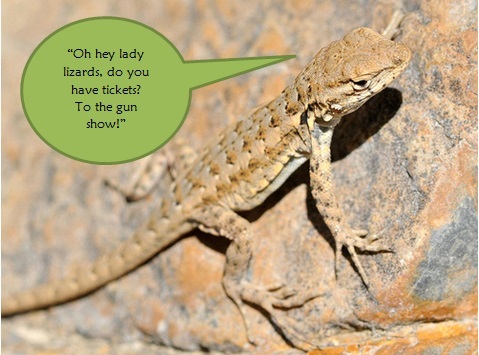 All male side-blotched lizards use a hilarious “push-up” display to defend their territory and attract the ladies! The blue-throated males forms a strong bond with their mate and although they can’t fight off the orange-throated desperados, they can successfully fight off the yellow-throated lizards. And then last, and in this case least, the yellow throats. It’s a little harder for them to find a second date. Also, this particular lizard is short-lived, only living for about a year. The side-blotched lizard is really sensitive to ecological environmental changes, so if there is just the tiniest fluctuation in the amount of rainfall in the area or the amount of other Side-Blotched Lizards around, they will hit the road in search of a better territory! 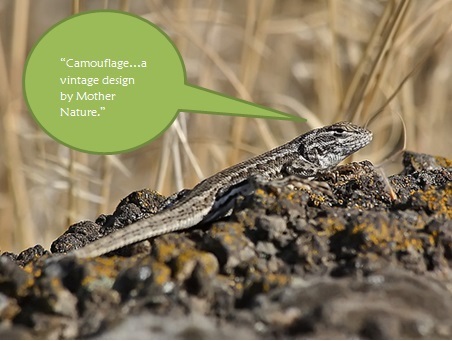 Sagebrush lizards like open spaces with low growing brush, especially sagebrush (no way??!) and the juniper forests of the high desert country. They are rather drab and well camouflaged, being gray, brown, or cream-colored with dark and light stripes running down their backs. To me, they like to chill out more than other lizards in the park, making them slightly easier to get a closer look at. Females have yellow or maize-colored bellies surrounded by cream or gray. Males have blue or purplish patches on their bellies and on their throats. 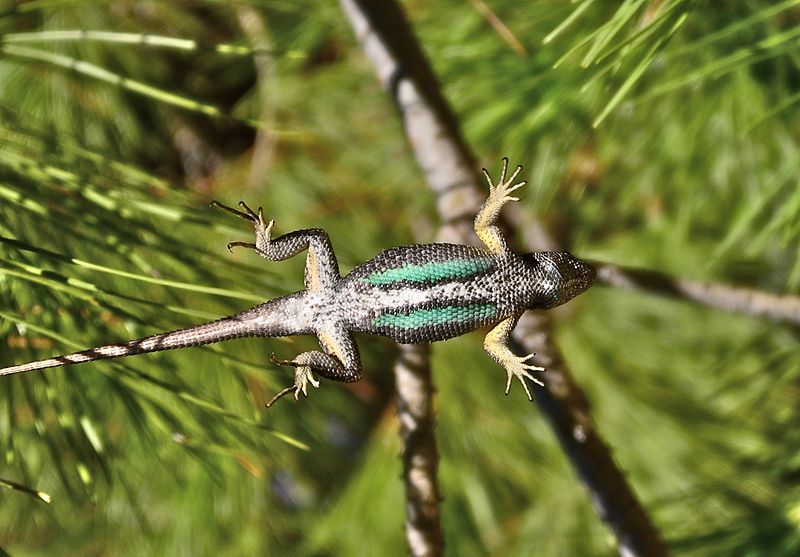 Like most lizards, these patches grow darker and more vivid during mating season. Ooo la la! Lizard! I have to ask…who are you wearing?! 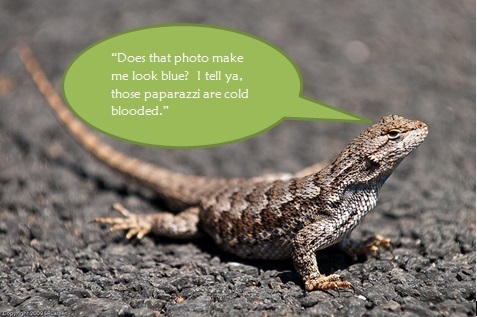 The adult western fence lizard has an abdomen that is characteristically blue, so this lizard is also known as “blue-belly”. These lizards are commonly seen sunning on paths, rocks, and fence posts, and other high places, which makes them an easy target for predation by snakes and birds of prey. They protect themselves by employing their fast reflexes, which are common in many other lizards. You better be able to move at mach speed to catch one of these buggers, but I have seen some quick campers who can do it! These lizards are dark brown or black in color, with six to seven light-colored stripes running down their backs. They have long tails that fade to a light-blue color at the ends. 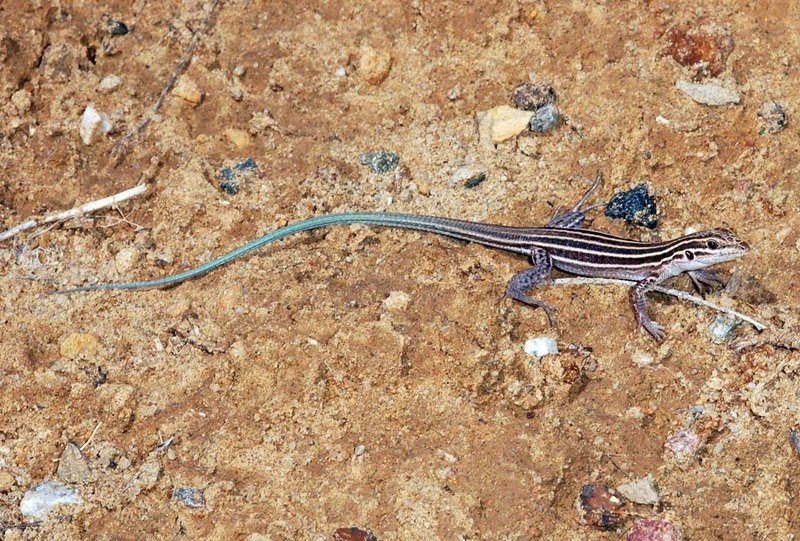 As is the case with most relatively small lizards, the diet of the plateau striped whiptail consists mainly of insects. The craziest fact of all, are you ready?! To impress all your nerdy, science friends? All plateau striped whiptails are females, and thus reproduce via parthenogenesis (eggs are not fertilized, but still develop). Individuals lay a single clutch of three to five eggs during June or July. Most dry-climate lizards spend the majority of their active time stationary, waiting for prey to come within range. Prey is usually detected visually. This is referred to as sit-and-wait, or ambush predation. Whiptails, on the other hand, forage actively, rarely sitting in one place long enough to even come close to catching, and their prey may be detected visually or by smell. For view more Liiiizards in person, come out to the Cove anytime in the Spring or Summer, and to learn more about Lizards and other Oregon herps, click Lizards!